Library Tours are being held again. You don't need to sign up - just show up! Please join us at one of the times and dates above in the Lobby of the Leddy Library. Tuesday, January 29, at 10 a.m. or 2 p.m.
Wednesday, January 30, at noon or 4 p.m.
Thursday, January 31, at 11 a.m. or 1 p.m.
Our tour takes about 20 minutes and includes a walk around the Leddy Main and West buildings. The tour stops at various service points and you will get explanations of our borrowing policies, collections and help services. 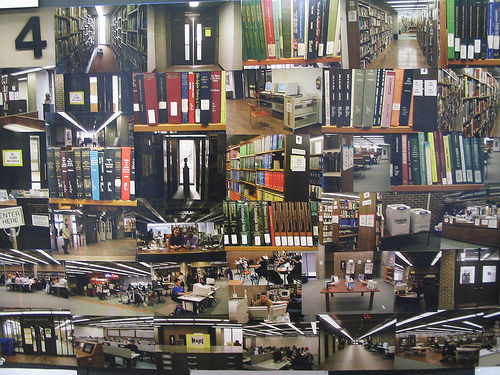 It's a great way to become familiar with the basic services and physical layout of the Leddy Library. The Library normally provides tours for new students during September and January. If your group would like a general or specialized tour of the library, please contact Connie Iaquinta to set up arrangements. Library tours are designed for library orientation and do not include research instruction. If you are a faculty member or teaching assistant and interested in having a more detailed session for your students in which a librarian teaches your students about the research process and using our various databases and resources please visit our Request Library Instruction page. For more information on our teaching services, please visit our Information Literacy and Instruction page.